I love this video from GNOWGFLINS because it so simply states the detailed workings of a sourdough starter and how to create one! I would like to add that a Pickl-It Jar would be a great vessel to keep your sourdough starter. Read my post about the proper vessels for fermenting, here. Previously I used a Fido Jar to keep my sourdough starter, but I found that over time the flavor gradually changed and I did not enjoy the taste of it anymore. I believe this was caused by the Fido jar not easily releasing carbon dioxide. Now I have to admit that I have not been making sourdough lately, but I am planning to start it once again, especially since I am missing my favorite Sourdough Chocolate Cake with Chocolate Buttercream Frosting! This cake has never failed to please me or the many people to which I have served it! Hardly anyone believes that it is sourdough. I’m also having a flashback to these amazing donuts I made with sourdough, Sprouted Grain Doughnuts with Coconut Vanilla Glaze. I experimented with several sourdough bread recipes with no success, until one recipe finally made the perfect sourdough bread (with a little adjustments here and there). I hope to start making this recipe again soon, just to test it and then share it with all of you. 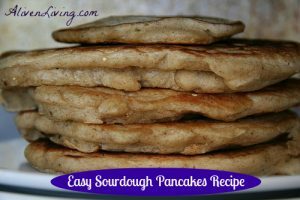 For now, I will leave you with the easiest recipe to make with your extra sourdough starter, Pancakes. That way your whole house doesn’t fill with sourdough, because that would be such a waste. Sourdough Pancakes are a great way to use your extra sourdough instead of throwing it away! 12 to 24 hours before you want to eat, combine in a large bowl the starter, water, and flour. Drop about 1/4 of a cup of the batter on a lightly oiled hot griddle (over medium to medium-high heat) until the the top is set, and the bottom lightly browned. Flip the pancake and cook until the pancake is lightly browned on the other side. Repeat until all of the batter is used, re-oiling the pan as needed. Serve with real maple syrup, butter, or a fruit topping and whipped cream. What Is Your Favorite Sourdough Recipe?